The tower on the east front was is the oldest part of the castle having been built by John de Crichton in c.1395 who received a charter of barony from Robert III (reigned 1390 – 1406. Born c.1337). It was his son, William, Lord Crichton, (? – 1454) was Chancellor of Scotland, (1439 – 1444 and 1448 – 1453) who built the Collegiate Church. He was in Edinburgh in 1444 when his sworn enemies, the Douglases, stormed the castle. He rebuilt the damaged parts and also added a fine range to the south, and created a new entrance pend, vaulted stores, and a new hall. The castle is a tower house with two ranges built at right angles to one another. The internal courtyard is small and one could be forgive in believing that at one time the whole structure was enclosed by a single roof. Although small, as castles go, this one is carefully designed the accommodation spacious. About 1585 the diamond-rusticated north range was added and which gave it a feeling of the cortile of an Italian palazzo. Some external features of the castle are noteworthy especially the Oriel window. Nearby is a building which at first sight looks like a chapel but it is in fact a stable. The Crichtons were dispossessed of the barony 1483 when for conspiring against James III reigned 1460 – 1488. Born 1452). In 1484 the barony was awarded to Sir John Ramsay of Bothwell (later Lord Bothwell) who fled to England after Sauchieburn (1488). The castle and lands were then granted to Sir Patrick Hepburn of Dunsyre in 1488 along with the Earldom of Bothwell. Mary Queen of Scots (reigned 1542 – 1567. Born 1542. Executed 1587) attended a wedding at the castle in 1562. James Hepburn , 4th Earl of Bothwell, (c.1535 – 1578) was the third husband of Mary Queen of Scots marrying in 1567 an event which caused a rebellion. Within a month of the marriage Mary was forced to surrender to her rebellious nobles. Bothwell fled to Orknet and thence to Norway where he was imprisoned for 11 years and dying in captivity. His embalmed body was gruesomely exhibited at a church in Faarevejle in modern Denmark. When Bothwell fled, the barony, along with the earldom of Bothwell, was forfeit. In 1581 the castle was claimed by Francis Stewart, 5th Earl of Bothwell (c.1563 – c.1612). Bothwell is something of an enigma. Well travelled and well educated he was often out of favour with the establishment. It was he who transformed the castle into a Renaissance residence. The diamond-faceted stonework of the north range added in 1585 are thought to have been modelled Palazzo Steripinto at Sciacca in Sicily or perhaps the Palazzo dei Diamante at Ferrara. 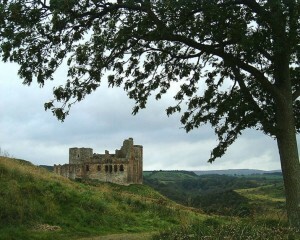 In 1595 Bothwell fell into disgrace for the last and final time and was forced to flee the country. He died in poverty in Naples, Italy. James VI (King of Scotland 1567 – 1625 and of Great Britain 1603 – 1625. Born 1567) ordered that the castle be ‘rasit and castin doun’ but the order was never carried into effect and the castle was left to slowly crumble. In 1926 Henry Burns Callander placed the ruin in the care of the state. The castle is a delight and anyone visiting the church should take the opportunity to visit the castle which is only a short walk away. The best time to visit both structures is on a Sunday afternoon between 14.00 – 16.00 hours during the summer months as this is the only time the interior of the church cane be viewed. The Castle is open April to September and cost £2.50 per adult and 75 per child.